On the one hand, Japan is well-known for its famous gorgeous geishas, top branded automobile concerns like Toyota and 70% of the territory is mountainous. Perhaps, the last one is not that famous fact. On the other hand, slowly but steadily Japan is transforming into an attractive tourists` destination not only for determined risk-taking travelers since the existence of one of the best ski slopes in the world and a wide range of unique winter activities. This country can excite even the most fastidious adventurers and make reckless extreme lovers jump from joy. The following unique winter activities give you the opportunity to have your best vacation in Japan. Going downhill is one of the best things to do in winter in Japan. There is a wide range of ski and snowboard resorts in Japan, as well as the huge number of options they provide: daredevils can test numerous varieties of schussing and sledding. Moreover, there are even more unique activities like snow tubing, snow-banana-boating or snow rafting that you can experience exclusively in Japan. An entire village made of ice is a superb hotspot for ravenous tourists. Built on Lake Shikaribetsu in North Japan, this settlement is a genuine frozen fairytale. On the premises of the village, you can find absolutely everything you imagined about an icy wonderland: a fully furnished ice lodge, a huge ice slide, igloo houses, an ice bar, where you can order an iced cocktail in an iced glass, or even a fancy ice chapel. In short, this icy wonder will definitely make you wonder for a long while. The traditional Japanese thermal pools, in Japanese “onsen,” is a carte-de-visite of the Japanese tourism industry, especially beloved by winter getaway seekers. Having a steamy bath in remote locations amidst the tranquility of snow-capped mountains is not just an out-of-the-ordinary feature of the local culture, but the natural gift of Japan’s volcanic ground with a little more than 3,000 of these natural bathes. Undoubtedly, winter is the best season to test these hot springs, when the nature covered with snow will make a stunning contrast to the hot bath you are chilling out. 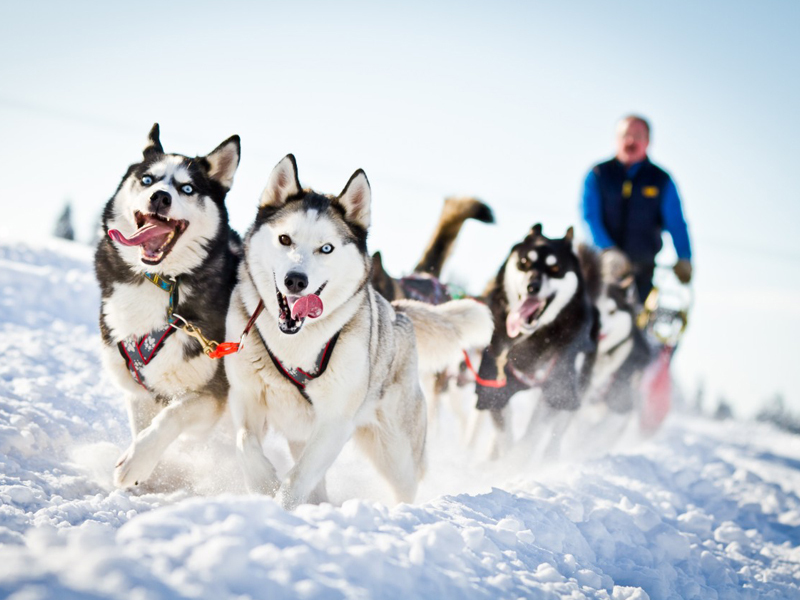 A sled full of screaming thrill-seekers pulled with a dizzying speed by a crew of beautiful huskies worrying along into fresh virgin snow through the picturesque scenery of snow-covered picks and woods – wouldn`t you give a try for that? A perfect image of Lapland tours, but Japan is not tailing along henceforth. There are several resorts offering dog sledding, but Asahikawa is truly the best one. Ice-covered waters and freezing temperatures are not the obstacles for enthusiastic Japanese fishermen. Fishing doesn`t stop in winter in Japan. In fact, you will find crowds of keen fishers on the frozen lakes instead. They catch teeny pond smelt with the rods from fishing holes drilled into the ice. Even if you don’t want to be a fisher, you can simply observe this unusual activity or, at least, taste a cooked up catch with a gas burner. All in all, winter is the best season to visit Japan, with its magnificent landscapes and various extraordinary activities.